Mix all pancake ingredients well. Pour one ladle and cook each side well. and spread over each pancake. 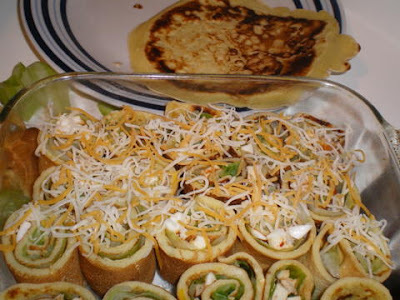 Lay the mixture of mozzarella cheese, white cheese, red pepper and parsley through the center of each leaf and firmly roll it over as in the picture. Then cut each roll into 2cm. pieces and place them on a tray. Scatter planed mozzarella cheese over the pieces and cook them until the cheese is melted.